Good morning everybody! I hope you're enjoying this lovely Thursday. It's such a nice day here today and it got a little bit warmer again. As you know, every other Thursday we have a new challenge for you at Crafty ribbons challenge blog and today is one of those Thursdays. ;) Our challenge for this forthnight is "Feeling fruity". We want to see something fruity on your creation - a fruity paper, a fruity image ... Anything really. And we have a wonderful prize for one of you too. Look! You will receive a Bev's bag, full of yummy ribbons. But keep in mind that the content of the bag may slightly vary from what's shown in the picture. I made a simple card for this challenge, but I was happy with how it turned out. I completely forgot I had this "You're a peach" stamp from Studio G, so I was positively surprised when I found it in the drawer. And I thought it would be perfect for this challenge. :) See the "ribbon border" (sort of) that I made around the image? I love how this turned out. And it was so fast and so easy to make! Will definitely do this again. 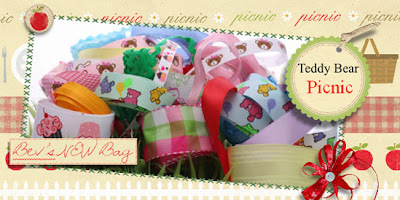 :) For the "ribbon border" I used the "Tri stripe ribbon" that you can find here. And for the bow and ribbon in the back I used the 23mm yellow satin ribbon that you can find here. Of course both of the ribbons are from Crafty ribbons. :) I colored the image with Faber Castell pencils and the papers I used are from Provo Craft. And the crystals are from my stash. Love the rich fall colors you've used and the ribbon around the image looks fantastic.